Output Factory Server automates printing and exporting from Adobe InDesign by processing files from watched hot folders. Output Factory Server offloads output from InDesign to a central system leaving operator stations free from the output process. Output Factory Server 2 supports macOS 10.7-10.14 and InDesign CS5-CC 2019. Output Factory Server 1 supports only up to macOS 10.12 and InDesign CC 2017. To use with the latest releases, please upgrade to Output Factory Server 2.
and improvements that will continue to be added in free updates. Print and export InDesign files automatically from watched hot folders. Output Factory Server can serve unlimited users on a network. Create hot folders for various workflows such as hi-res PDF, laser printer, EPUB etc. Users can submit single files and books or collected jobs. Export InDesign documents as single page (or spread) files. Output Factory supports printing and exporting to PDF, PostScript, EPS, Flash, IDML, HTML, EPUB, INDD and several image formats. Create sequences of workflows to output InDesign files to multiple formats at once. For example, create an action to export files as hi-res PDF, lo-res PDF and TIFF. Drop InDesign files into the action's hot folder to export to all three formats automatically. Output Factory offers unmatched abilities to create variable output file names based on file name, page number, date and other attributes. You can even insert dynamic content from your documents using the script label variable. Output InDesign layers and their combinations as separate files automatically - an indispensable feature for multilingual documents and other projects with layered content. With Output Factory, output errors are a thing of the past. 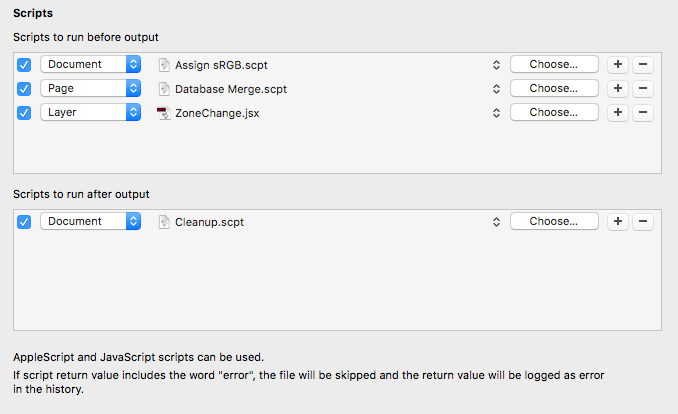 Thoroughly check files using InDesign's preflight or Output Factory's own options, and skip files with errors. Review errors in the History with their detailed description. Output Factory can also automatically check final PDFs using Acrobat Pro's preflight droplets. Output Factory Server can send automatic email notifications based on powerful variable templates. Notifications can be triggered by errors and other events. Send output files to FTP, Amazon S3 and other servers, or by email, via seamless integration with Deliver and Deliver Express. Keep track of all processed jobs as well as errors, warnings and final output files. • Actions: Output to multiple formats from a single hot folder. • Process aliases instead of original InDesign files. • Open final files with selected app. • Improved Script Label token. • Ignore script label on hidden layers. • Numerous fixes and improvements in stability and performance.